This piece may read as a little patronising and I apologise but can find no other way! For those who haven't been, I hope this will be valuable and for those of you who have, I trust your recognise my purpose. Every racer should race on at least 2 European circuits and my favourites are Spa Francochamps and Nürburgring (Nordschliefe). These are beautiful circuits and both are highly challenging. With van and trailer Spa is about 7hrs from Calais and Nürburgring about 8.5hrs, but it’s worth it. This note is about racing at Nürburgring. This note was written because of the significant cultural differences between racing in UK and in Germany. Also though many Germans speak very good English the technical and engineering terms are often different. Hopefully this note will help. It is however not a definitive guide nor is it in anyway endorsed by any official bodies and only represents the views of the author. This circuit was built in the late 1920s to help develop German race cars; notably the Mercedes and Auto Unions, to beat the British and French who dominated "auto racing" at that time. In the 1920s and for that matter all the way to 1960s, people were used to death. Millions had died in the trenches and millions would again die in WWII. The circuit was built at a time when life was entirely expendable and don't let a bit of modern day Armco fool you into believing this circuits character has soften over the years. It is quite simply the most dangerous circuit in the world. This is the most deadly 22km of road certainly in the USA and Europe for both Trackday and Race drivers. It's also the most exhilarating when you get it right. As the Romans might have said "Cave" (Kae Vee)". First things first! Please support Save The Ring. From 2007 - 2009 the German government built a huge Leisure Park at the Nürburgring. It is based on fake visitor numbers, oversized and badly executed. Most of the time it is an empty ghost town. Once promised as private investment, it is now based on a debt of 350+ million EUR public money. Instead of pulling the plug they rented the park - including both race tracks - to exactly the same privateers (Kai Richter, Jörg Lindner), who were driving forces behind the Leisure Park's initial private setup. There are fundamental differences between racing in Britain and Germany especially to the clubman racer. These are very sweeping generalisations but racing in Britain is organised, scrutineered and raced by largely guys who appear as those who are prepared to muck in and make it work. 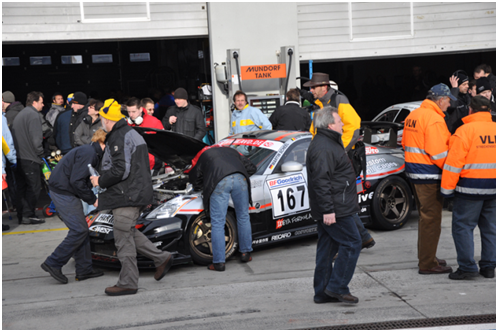 The scrutineers are guys who give up their time to ensure you and your fellow competitors have a safe race. The focus in the scrutineering is on the engineering and technical presentation of the car. A technically well engineered but well campaigned slightly tatty car is welcomed. In Germany, especially to a non-German speaker, it is different. Everything must be correct and in order. Your car must be presentable and look as if it has been well prepared, very well prepared. There are documents, normally downloadable but in German, that need to be filled in regarding ownership of the car, details of the team running it and of those driving it. You must have all the race entry documentation filled in and you must only sign them; team leader, drivers and if testing, passengers, in front of the officials in race control. The drivers obviously must have their road and race licences and you must also have copies. It is also worth buying a copy of the DMSB Handbuch Automobil which is the equivalent of the MSA Bluebook. Unfortunately an English translation is not available. • Racing / Sports Seats are not allowed but the used seats must provide enough security for events like this, seats that fulfil DMSB regulations are allowed (ie those in full racecars). If the driver is not the owner of the car then the owner should fill out page 2 of the driver form and its usually easier to make the team leader the owner, especially if the owner is not present. Any intended passengers get their own forms too. The car must have some kind of national registration document e.g. DVLA. You might think this is a problem especially if you bought a car that's always been a race car. If it’s a production based car get the chassis number and see if the DVLA can give you some info. It would not be condoned; of course, to find a similar road car; colour scan in the document and use a graphics editor to replace the information with that of your car. They are not going to ring up the DVLA or check with British Police or DVLA, but they are going to check that your document details match the chassis and engine number of the car! If it’s a purpose built race car; ideally get the records from the manufacturer. The roll cage must have a certificate, even though these have been largely depreciated in UK. 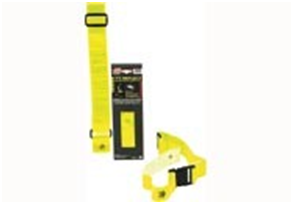 If you don't have one either try to get one from the supplier, designer or manufacturer, else see above. If the roll cage has a serial number tag welded to it and it matches the documentation..ah zehr gutt. You should also record all the serial numbers and FIA expiry dates of equipment such as seats, fire extinguisher systems, seat belts and anything else you can think of. If you have an ATL fuel cell record all its details. Note that just because a piece of equipment passed UK and FIA regulations it does not mean it will pass the German ones. Little ‘big’ things can be very expensive to rectify at the circuit. They also don't like exposed standard internal panels with cut-outs/holes in them and prefer to see them covered with something like a carbon fibre panel, or even the standard trim. It is a good idea to have detailed records and/or copies of every person in the team; names; Passports, UK address; German accommodation address, mobile phone numbers, next of kin, travel and medical insurance, European Heath Insurance card, allergies, medical conditions. Travel details such flights, ferries and details of every road vehicle in the team. Have photographs of the car from several angles including interior, roll cage and engine bay. You might consider photographs of the each member of the team. Find a German speaking motorsport fan who is prepared to help. You should also have records of a bank account, including the IBAN number because any refunds will only be paid into a bank account, even though they generally only take cash. Have everything with multiple copies in the most officious and presentable file system you can carry. Have that file system in a brief case, a good one, wear a decent jacket and clean clothes and ideally have the whole team wearing matching shirts and or overalls! There is normally a reasonably representation of German motorsport accessory suppliers on site especially for any significant race but they are not cheap and with current £/€ 1:1 rates making it worse. So take what you can. You'll ideally need an in-car radio system that you can easily switch channels to avoid heavy congestion, for which you need a license and the appropriate form filled in and copies thereof in your file systems. If you want a usable range beyond about a 2 mile radius from the pits, you'll need to mount a very long antenna because for the terrain and sometime weather conditions. Some do this on their truck and some seem to be able to use the roof of the ‘boxes’ above the pits. The pit crew should also have two way PMR446 (Private Mobile Radio, 446MHz) handsets. Be aware that there will be a lot of them about so the higher the quality the better the reception. The drivers should take their mobile phones with them while driving as its the easiest way to report back after an incident at the far end of the circuit. Be prepared for wide variation in weather conditions. Being in the Eifel mountains it has its own eco-system; possible more erratic than Spa, and it can be erratic and can change from one part of the circuit to another. Also make sure everyone has comfortable shoes as they'll be doing lots of walking and standing around! You will need at least €1500 in cash per car and it would be sensible of each member of the team to carry reasonable funds in cash which can be combined in an emergency. If you are intending to refuel during the race the refueller should wear fireproof kit (race overalls); you should have a metal exhaust pipe cover, or as many as you need to cover the exhaust tailpipe hot bits; and a 5Kg dry foam extinguisher (with appropriate labeling and expiry/filling info). Once the race is running the Germans in the garage are all very friendly and prepared to let you borrow their extinguishers if they're not using them and you should do likewise. But do have clear identification on your equipment. Glass cleaning products and cloths are vital for quick use during pit stops. And easily forgotten. Checkout the VLN webpage for all the regulations and in particular for the sponsor instructions which will give details of the stickers and how they are to be applied. It is in both German and English. One of the quickest ways; even though it doesn't look so on the map, to Nürburgring is to travel as if going to Spa. We avoid Brussels and go via Lille and Mons. • At Blankenheimerdorf its best to follow main road (51/258/E29) around to East and then loop back towards Blankenheim where the 258 continues South. If you get to Mulheimer Haus you should turn back. • Now follow the 258 all the way to Nürburgring; via Farm Aruel, Metternicher Haus, Oberahreck, Ahrhutte, Neuhof, Ahrdorf, Musch, Kirmutscheid, Barweiler, Wiesemscheid. 278 miles (440km) from Calais. There is a convoluted procedure for signing in with the car, which is not normally well described on the entry forms, because I suppose if you've been running a major series such as VLN all season you should know. Item 3 may also be different if you're at a major event such as a 24-hr race and you have brought an articulated trailer and tractor unit. 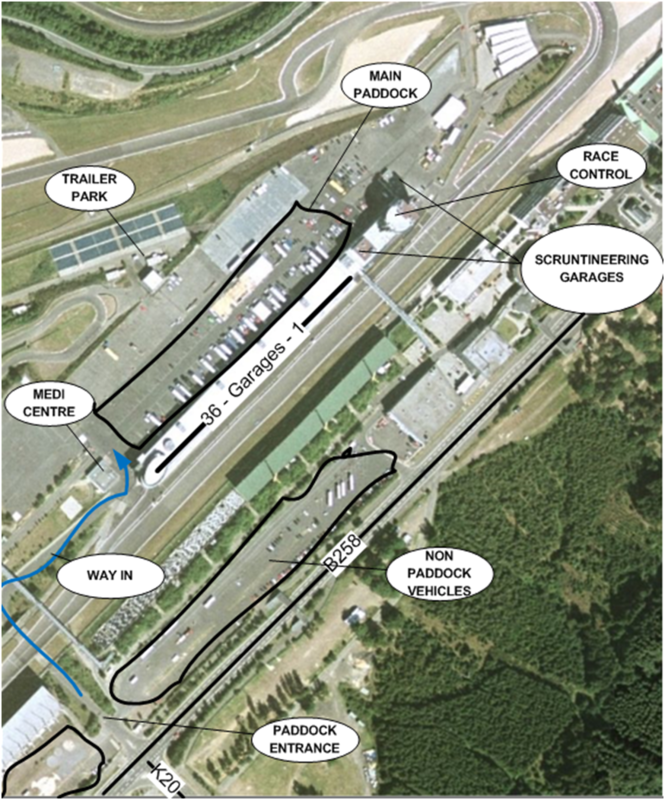 The trailer can stay in the paddock but the tractor unit will be sent to a tractor park well outside of the circuit. Be prepared to follow the unit out so you can bring the driver back, unless they intend to live in and around the unit! The first office used to be outside the entry gates, but I guess due to traffic volumes clogging the road they have created an external site. To get to the first ticket office you must join the loop on the left hand side of the map from the B258. It is signposted if you're looking for it. This road is designed for Formula 1 transporters so you should find it easily enough. You follow the loop around unit you come to a lay-by on your right hand side with a portacabin. You present your entry details here and should get tickets for one service vehicle and trailer and one car unless you have made other arrangements. The service vehicle will be permitted to park in the paddock but the other will be allowed entry but will not be allowed to remain there and will have to be parked in one of the other car parks, for example just to the west of the entrance outside of the circuit. Once you have all the requisite tickets you can continue following the road to the T-junction at the K-20, turn left, over the roundabout into the entrance of the circuit. This is the one and only time you won’t need to have cash! No more than 75m from the roundabout is the Paddock ‘gate’ where you will be expected to show you tickets just collected and to pay a refundable deposit (was €50) for the trailer. When you take the trailer to the trailer park the attendant will exchange your ticket for the deposit value. You should also ask for yellow ADAC pit-wall jackets (gelbe Jacke (g-el-ba yacka)), which are like the cyclist yellow fluorescent Sam Brown belts with the German AutoUnion ADAC lettering. This inevitably will require a deposit. We forgot and got away with the Motorway safety jackets that you should have anyway when traveling in Europe. Remember if you have anyone arriving at the track without a ticket they won't get in and that includes the pizza delivery man! The map below shows the general layout of the paddock that you enter from the bottom left corner having negotiated the guards at the gate! The temptation is to park up as soon as you can after having driven for 8hrs and gone through all the bureaucracy, but everything you will need to deal with of major importance is up at the Race Control end. Try to find somewhere as close to that end as you can, but don't park in the area immediately in front of Race Control or the scrutineering bays (Garages 1-3 normally) or the officials won’t like that! If you get there last minute you'll have no choice and have to park wherever is legal. Also do not park in restricted areas or in the main routes as marked out. If you're at a large event the back of the paddock opposite Garages 1-10, outside and above the area drawn is used for suppliers and tyre companies. The trailer is usually parked behind the washroom block; shown on the map above. If its not a particularly busy meeting the trailers may be parked in the paddock, near this block rather than down the hill behind it. Just look for lots of trailers and the guy collecting tickets. While the team leader and drivers are going to Race Control, others should go down to the scrutineering bay and or look at other cars to see exactly which stickers are in use and where they are placed. If you get the locations and angles wrong you'll have to redo them to get through scrutineering.Do not argue about it. If you already know the race number you can get the numbers and all these stickers from the scrutineering garages and start to get them on the car. 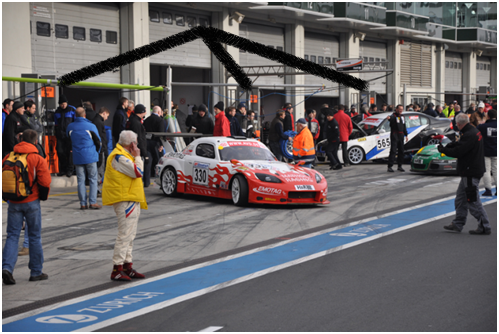 The VLN webpage (2010) gives the exact layout and this must be followed precisely. Race Control in in the Media Centre tower at the top of the pit lane. The ground floor house all the offices some of which you will need to visit before, during and after the race. The 2nd floor houses the media centre where most of the preliminaries are undertaken. At the far end from the entrance are several tables where officials will go through all your documentation and provide you with the pass required to go through scrutineering. If you have multiple drivers you'll be given a card, or told where to get it, to be signed by the pit-box marshal on each driver change. After the race this will be presented to the administration office. At this level is the desk where you will rent a transducer (cash only) using the appropriate form and, in 2010, 400 Euros. When the transponder is returned the refund is made by bank transfer and not cash. There is also a handling fee and a charge for non-German bank transfers. As you leave is another desk where you can buy (cash only) extra track testing time. On the ground floor is an office which will assign you to a garage (‘box’). This is important even if you don't actually keep the car in the garage, this is where you will refuel and work on the car during the race if required. The appropriate forms of course must be filled in if you want to hire space in a garage. The “Mundorf Tank” fuel pumps are locate between pairs of garages as can be seen in these 2 pictures stolen from my friend Roland Giehl. Highlighted with the 3 black lines. The fuel was 98 RON but its worth checking with organisers. It is important to find the ‘Gas Meister’, who typically will be one of the main people of the first team in the Garage and who is responsible for collecting all the money for the fuel. If you are not a regular nor a German speaker you do not want this role! Race Control will have taken a Fuel Deposit and the Gas Meister is responsible for maintaining records. It's largely an honour system where you write your details and the litres used on a form taped to the side of the pumps. There are plenty of parties who keep a very close eye on the fuel pumps as in a 4hr race more than 1200L will have been burnt by each 6 car garage. Scrutineering is undertaken normally in the first 3 pit garages and there is also an area that looks more familiar to British racers that is used for noise testing and post race scrutineering, just outside Race Control. All the area behind this is where you will get on to the circuit from the Paddock and after the race will become a huge parc fermé. Just as with everything so far to get through scrutineering cleanly you must look professional, the car must be spotless, all the series stickers and numbers must be clean and perfectly positioned and don't put them on while the car is being scrutineered as scrutineers will take their time to process you if they don't think you're serious. Have the folder with all the details of the car ready. Never argue with the scrutineers, their word is law and cannot be countermanded. It pays to be very humble as they'll probably be less than impressed with the amateur Britischers anyway. It will help if you have a copy of DMSB-Handbuch Automobilsport; the German Bluebook, with English translations of key areas. Having the book on you, or in your briefcase, with the other documents makes you look more competent. It pays to read the Handbuch very closely, as you would with the MSA Competitors Yearbook (Bluebook). If more than one driver is registered you will expect to have a card which need to filled in a signed by the pit/box marshal at each driver change. This then must be handed in to the race office on the ground floor within 15mins of the end of the race. The office can be reached either from the paddock side or from the top of the pit lane where it is the 1st office inside the door. Racing on the Nordschleife is like no other racing in the world and it's very easy to get sucked in to an aggressive short circuit style that will kill the car if not worse. At a reasonable pace of 85+mph in a Saloon car its going to take around 11 minutes per lap. Forget the You-Tube videos showing Radicals going round in under 8 minutes. They are only doing the Nordschliefe (possibly only one lap) and the last 30s is usually estimated as they are not normally allowed to do flying laps, they are also not doing 2/3rds of the GP circuit too. They also don't have to do 2,4,6 or however hours racing and if you are in a multi-driver team, you owe it to your team mates to bring the car home in a serviceable condition. If you damaged the car or have a puncture soon after the Start-Finish line you may be obliged to drive at 10-15mph for 15 miles. Yes, that's 1 hour! Setting fire to the punctured tyre and then the car by driving too fast, and covering the track with burning rubber not only will make you very unpopular, but may ban you and the team for a while. Also consider being on the wrong side of a blind corner or crest doing 15mph with others vehicle approaching even under waved yellows, or white at 80+mph! Unlike a modern circuit, it is not designed to bring you to a relatively easy stop. At least now there is an Armco barrier all around the Nordschleife, in Jackie Stewart's day there were just the pine trees and ravines! If you make a mistake you are likely to hit something and HARD. You may have noticed that the average speed I've suggested of 85mph may seem a little low considering some part of the track you might be flat out. The Nordschleife is a 1930's road; it bumpy, narrow, hilly and very long. Its like doing Cadwell Park, Lydden Hill, and Pembrey together 5 times a lap, except that the track is rougher and there's more than 1000ft altitude difference. You hit the Armco and you have a very long wait, or of course ..........Oblivion. Also remember a car with a 80L tank that will do 11min laps at 14.75L/lap, may well beat the same car doing 10min laps at 16L/lap, because of the 2min extra pit stop for fuelling. Also be aware that some drivers out there have done 10,000km or more on the circuit. There are people who work in Cologne several hours away, but live adjacent to the circuit to drive it at every opportunity. There are multiple classes and that Opel Corsa that's just blown you away may have a DTM V6 in it and is driven by a Ring Meister. Drive within yourself, smooth, with time for every action and enjoy. Read and watch everything you can, whether its the Autosport Euro Circuit Guide or YouTube or Duke bike videos or a computer game. I recommend learning the corners by name, by rote and be able to identify where any frame in a track video is on a map. The GP circuit is like any other an relatively easy to drive quickly enough, so it not being in GPL is not an issue. Nothing will prepare you for how bumpy the circuit is, the blind corners and just how fast 175mph is in a race car while being blitz'd by a Viper at 200mph. Being able to remember where you are and where the next corner goes can easily save you a minute a lap. Note many of the German GTx Porsches are actually on short gearing and can't get beyond about 150mph. There are numerous websites dedicated to the Ring and though many of them are aimed at the Trackday participant they are still very useful. In particular Ben Lovejoy's site. Jan Willem Hubber's site has some good stuff too, particularly his " Before going out" safety leaflet for open days and his " Know the dangerous spots". He, like me, learned the track from GPL. Take your mobile phone in your race suite where it can't fall out or become lodged somewhere uncomfortable! If you're the starting driver and subjected to whole lap Green flag lap, have drinking fluid in the car but try not to use it until you really need it. The Green flag lap can take 20 minutes to get to the rolling start! That's a long time when you dying for a P! Consider your diet and legal stimulants, such as Red Bull™, because you will have to concentrate harder than for any other circuit. Weather is a major consideration. Nürburgring is in the Eifel mountains and has very similar weather to Spa Francochamps in the Arden down the road. The circuit is so long, with altitude changes of over 300m and parts surrounded by forest, there can be different weather systems all around the track. The top could be in fog, the down side after Hoche Acht (the top of the circuit) is surrounded by trees and can be very slippery in the wet or dawn dew conditions, while other parts of the circuit can be in blazing sunshine. Please remember that Jackie Stewart, one of the greatest drivers of all time and one of the fastest in his time around the Nürburgring, especially in the wet, called it the Green Hell and through the GPDA took GP racing away from the Ring. At least now there are barriers! Preparing a car for Nürburgring Nordschliefe is like preparing to do a whole season in one day, even if you're not doing the 24-hr race. In a 4hr VLN race with one pit stop the car will have run about 360 miles including the Green Flag lap climbed up and down about 22000ft (7200m), it will have been thrown around in the Karussel, it will have screamed up Kesselschen under full power for 30seconds and will have been driven faster and for longer down the straight from Dottinger Hohe. 165 laps of Cadwell Park doesn't come close. Another point is that the circuit is incredibly rough by modern circuit standards and definitely doesn't come up to modern German road quality, let along that of a racetrack, excepting the GP circuit. You may notice that the roads up to your hotel are significant better. It is very similar to the A and B roads of Britain. Just as the super hard suspension cars of AMG, Hartge, Schnitzer and Ruf; to name a few, do not work well on UK roads; with the more 'standard' sports Mercedes, BMW M series and Carrera Porsches being better options, so it is for the Nordschliefe. The car should not run too low, the Karussell will break low splitters and jam them under the car, and it should run softer suspension than normal. The dampers are going to get a hammering even if you avoid the curbs (recommended). Particularly what's called the low speed control of the damper. This is the relatively short shaft movement but high frequency, as opposed to the high speed "we've smashed a curb" control. Damper cooling may be a consideration and those with external reservoirs may offer an advantage. Suspension and Tyre setup that work on UK tracks may not work here. The BMW E36 M3 I've raced here, in what was then Group N5, ran standard BMW suspension with 3-way Proflex damper/coilovers and Dunlop Slicks (these were Crossply/Bias construction), worked well in dry warm conditions. This car was designed for this circuit and the dampers were just tightened up a bit for UK, which worked for this car. Another much lighter car on UK circuit suspension and Toyo R888s in the very cold and damp wouldn't work. A set a Hankook Ventus semi-slicks as recommended by someone with more local knowledge worked surprisingly well on the car. Given time and testing the R888s could have been / will be made to work. Also given the disaster of having a puncture, the tyres should be next to new at the start of the race and should depending on the car be changed at least every 4 hours, just to be sure. There is also an argument that as a Clubman racer, very good Trackday tyres will serve you better than full race tyres should the weather be changeable. The brakes will take a lot of punishment, they are used a lot in some sections, from higher speeds and perhaps worse, where they are not used, cool down then slammed on from high speed. On the M3s we looked to change the pads every 6hrs and the front disks after about 14 hrs, again its about being sure. An extra 15 minutes in the pits is nothing compared to a major brake failure out on the circuit. Its may be worth changing disks and pads mid-race, especially for longer races. Having pre-bedded-in disks and pad sets is a good idea and to have practiced changing them at speed. There was a maximum fuel capacity permitted of 100L and typically consideration should be made to ensure that car can run at least 2hrs per tank. The 300bhp BMW M3 would use 92L per 2hrs or 11 laps which meant that if the driver forgot and ran the 12 lap it would be marginal if he got back! Weather and the driving styles can make a huge difference to the fuel consumption. Designing the system to hold a little more in the pipes etc can be helpful, but don't put more than 100L in at the pit stops! The engine should be as fresh as possible and if you're doing the 24-hr race, freshly run-in from a complete rebuild. Try explaining to your pay drivers why your bullet proof motor expired after 18 hrs, having already done several hours sprinting in UK. Anything that you would replace for a 'full race service' do so. Transmission components and fluids should be fettled likewise. If the clutch has done a lot of work, why not replace it, the thrust and the spigot bearing, its better doing so in the workshop than doing so in Germany. Though not usual on a UK sprint car, having effective wipers and a screen washer system is very important. Also because of the extremes of weather that can be faced the windscreen demisting system must work. A driver drink system should also be considered especially when running in summer. If the car is going to be run at night very effective lighting will be required. Traditional high powered lamps/bulbs are a waste of time as one of the professional cars passes yours with 6 or more 300W HID lamps and leaves your driver with 4 130W lamps it will like trying to see with a 4W torch bulb. 2 x Corner lamps, either crossing each other at 45 deg to ahead, or on each respective front corner. Also consider "Disco" style LED marker lights for identifying the car coming down the pitlane at night and in the rain. These can be placed along the top of the windscreen, down one A pillar, in the door mirror backing. But consider the vulnerability o damage. Simple wiring if the lights are on so are these and they can be fixed or flashing provided they're out of sight of the driver and not going to interfere with other drivers. The instrumentation and switch gear in the car will need illumination and/or fluorescent paint. The alternator and battery may to have to be bigger than for sprint and day racing and the wiring gauge may also need attention. The pit man-power, equipment, and spares list will depend upon both the length of the race and of course budget. However the over-riding factor is that it is not worth driving nearly 20hrs, there and back, because you forgot or can't do something. It is possible to get stuff at the circuit and if you know your way around Western Germany in Frankfurt, Koln and Mainz, but its expensive. Also you probably have a right hand drive car and most German distributors want VIN numbers to conform with the TUV. Ideally have a trolley that can carry everything. One or more light (Aluminium) Quick-lift Jack, even if you have air jacks. Air Jacks - these are optional, but if you have them make sure you have fully charged air bottles and carry an assortment of adapters that while allow any of the common bottle fittings to be used with your system. Teams often have problems with air and most teams in a garage will help each other out, but continental fittings and UK/US fittings are different. Wheel lug-nut guns - 2 portable battery operated guns required at all times. Wheels/Tyres - at least one for each side at all times. Soak up paper - normal garage paper rolls for general wiping and cleaning oils etc. Refueling - Exhaust pipe cover(s), 5Kg Foam Extinguisher, Overalls and of course permission! Radio Base Station - If you have the ability to run a very long aerial do so. Some mount them on the trailer units, other find a way to mount them on the roof of the viewing boxes above the garages - I don't know how they get permission or access. Timing - At least one person must have the stop watch(es) and record laps etc. This is really important not only for letting the team prepare for inbound cars and for assessing how hard the car is being driven. This person should also handle the normal communications with driver. The non-base station radios should be able to communicate with the drivers from Antoniusbuche; the bridge 2/3rds down the Dottinger-Hohe straight, through the GP circuit to almost Flugplatz. It will depend on the weather and your equipment. Its also quite useful for the driver to count down his time under the BMW bridge over the pit straight, so that if the Timer is not on the pit wall he can still take the time. The timing of pits stop is also important. TV - You can also pick up Timing and Circuit TV from the feeds in the garage and pit walls. The professional team are normally very well equipped for this. You will need a TV, ideally LCD that can be hung on the wire mesh between the garages, or on the pit wall, that can handle the German PAL B/G signal. As from 2010, WIGE who provide TV coverage for the VLN provides DVB-T (Freeview) live coverage using a commercially available DVB-T receiving set including the Hauppauge kit for PCs and laptops. In addition to a TV channel with live pictures from the Grand Prix Circuit and the pit lane, the service includes three data channels with unrestricted access to the timing monitors. Night Racing - You might want to consider a pair of Marshalling Wands from the aircraft handling industry. Also you must have methods to filter out the lighting power of vehicle behind for all the mirrors and rear window. The number and type of spares carried will depend on the length of the race and the number of cars being supported. The amount of time you will have to work on the car will also affect this. If you running a 4 hour race the car can be off the road for 2 hrs and still finish ahead of others. In a 24-hr race 10 hrs off the road is not unknown. Indeed it is rumoured that a couple of gentlemen racers regularly used to to enter a Lamborghini into the 24-hrs, but didn't like night racing, so they'd start at 3pm and stop at 7pm, go back to the hotel and return in the morning, starting once dew had lifted and continue until the finish! It is sometimes possible to get out to cars stranded out on the track. You can't get on to the track but if the car has pulled off behind the Armco and is in a safe place you may be able to work on it. You'll need a Quad bike with racks. Having spent so much time on the car and the racing its easy to forget yourself, the drivers and the pit crew. Fluids, salts and food are necessary even on a relatively short race. Someone has to be responsible for the welfare of the personal. If you're a small team look after each other. Standing around for 4 hours in the sun without respite might seem obviously foolish, but its easily done in the heat of the race. Equally engineers that are battling away to get a beaten up vehicle back on the track should be kept supplied with drink and snacks. Larger teams may have a cook with a check list to monitor everyone's consumption. Again larger teams should have a registered First Aider for the minor things; note the paramedics and medical staff in the paddock are F1 standard. A masseuse can also be a great asset for both the drivers and engineers. Refreshments and food can be bought from the various stalls around the paddock, however not with cash. You have to buy a card from one of many individuals loitering around the stalls. Since you are almost certainly going to leave the circuit with Euros left on it and the Circuit charges the vendors for the privilege, its a nice earner over the year! Buying one or more communal cards may be more effective.